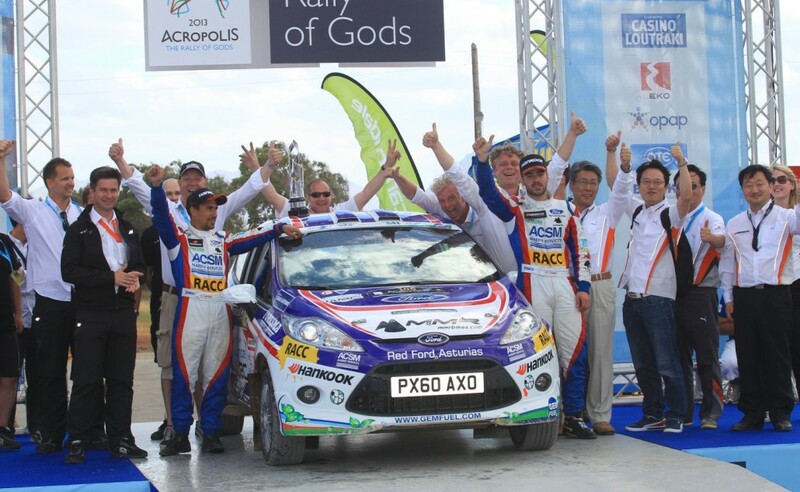 The Acropolis Rally of Greece saw the debut of GEM Fuel as the official fuel for the FIA 2013 Junior WRC. On Friday 31st of May the 10 driver making up the championship had their first taste of GEM Fuel in the pre-rally shake down and the subsequent 3 days of rallying on the toughest stages of the world. GEM Fuel proved to be as tough as the stages, providing reliable and sustainable power in dusty Greece. Before the rally got underway the Junior WRC organised a briefing session for press and other interested parties, publically introducing GEM Fuel to the world. The short version can be seen here: http://gemfuel.com/news/. After all the formalities it was time to see how GEM Fuel would perform on the touch Greek stages. This year’s Acropolis Rally threw some 300 kilometers of dusty and rocky stages at the competitors. The first day immediately saw big drama with competitors suffering punctures and suspension damage, Jose Suarez of Spain proved to be the smartest and led the rally after the first day. In the following days his pace proved to be unbeatable, despite Pontis Tidemand of Sweden winning every stage, and Jose Suarez won the second round of the FIA Junior WRC at the Acropolis Rally in Greece. His Ford Fiesta R2 finished 1min 04.2sec ahead of Pontus Tidemand. “I didn’t used to find it so easy competing on gravel, but my results this weekend really show the improvement I’ve made since I started competing in the WRC Academy in 2011,” said Suarez. Tidemand was relieved to keep his series lead. “It wasn’t easy getting a puncture so early in the rally, immediately putting us at a disadvantage. But we found a good rhythm and pace, climbed to second and were really happy to hold our lead in the championship,” he said. To see how all others Junior WRC Drivers faired in Greece, read the full report here. GUTTS and it’s partners Abengoa, BioMCN, Eurol, Methanex and the Methanol Institute, look back on a very successful launch of GEM Fuel in Greece. Edward Goossens: “We couldn’t have picked a tougher event for the debut, the Greek stages are very touch, long and hot, but the fuel proved to be a real GEM! All drivers were very happy with the efficient performance of the fuel. We will now continue to work on setting up the data analysis and research and telling the world about this amazing fuel”. GEM Fuel is a ternary blend fuel containing 37% regular gasoline, 21% bio-ethanol and 42% bio-methanol, has a largely increased biomass limit and reduces CO2 emissions by over 70% compared to regular petrol. The production and distribution of GEM Fuel is executed by GUTTS in the Netherlands. Please visit www.gemfuel.comfor more information.